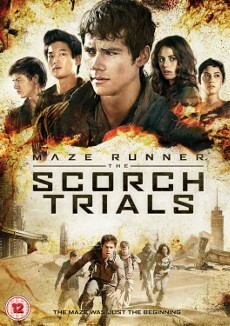 The Maze Runner movies belong to the rather brutal representatives of the Yung Adult subgenre. But particularly in the UK, there are often problems regarding the BBFC rating. Because eben though the movies are primarily made for a younger audience, the BBFC does not believe that younger people resp. 12-year-olds should watch it. Consequently, both installments were rated "BBFC 15". This was unacceptable for 20th Century Fox and as a result, a BBFC 12 Version was edited. While the first installments lacks 42 seconds, the here compared second installment lacks 41 seconds. The BBFC 12 is still rather graphic though and a lot of scenes with the zombie-like Cranks are still in it. The most footage has been removed from the interogation of Marcus. Apparently, the beaten up faces were too much for the children. Regarding the home theater releases, the politics of the first installment apply. Meaning: cut in movie theaters and on the regular Blu-ray/DVD, the uncut BBFC 15 version is only available on a limited steelbook Blu-ray version. Compared are the cut UK Version (BBFC 12) and the Uncut Version (German Blu-ray), both released by 20th Century Fox Home Entertainment. The BBFC 12 Version lacks 40.52 seconds. The female Crank longer, then a cut to Thomas and Minho. Additional shot of Newt trying to block the Crank's attack. Extended shot of the boys trying to pull Winston away from the Cranks. Those creatures scratch Winston's belly via close-up. The Crank bites into the rat. Further shot of the Crank and the rat. The Crank keeps approaching Thomas and Brenda. Missing scream of the Crank before he starts running. Jorge tells Marcus he does not like hurting him. Jorge longer, then the cut to Marcus. The UK Version contains a shot of Teresa instead. The distance shot is zoomed in in the UK Version. Instead of Marcus, one gets to see Thomas and Minho first. Then Jorge standing in front of Marcus. The UK Version shows Teresa one more time while the shot of Jorge begins a bit earlier in the Uncut Version. The Uncut Version contains a closer shot of Marcus while the UK Version contains a distance shot of him. Marcus for the last time.